The first demo of Finnish death metal quartet Defiled Icon is some of the most sewage-drenched and old school-filthy sung-in-Finnish DM that I’ve heard from our shores in a long time (which mainly means that I don’t listen around hard enough, but I digress). True to the disc’s title Mätä Ruumis (Finnish for Rotten Corpse), the 3 songs within combine the early days of Entombed, the raw feeling of a faster Six Feet Under and also a little Bolt Thrower, I’d say. The vocalists guttural churning is in strong form and the guitar riffs remain appropriately muddy and disemboweling. The drums, while very skillfully played, get buried in the mix a bit a end up tinny, especially when talking about the cymbals. Par for the course for this style of music for sure, so those who are not the kind of hi-fi wankers such as myself, do enjoy. Even I can enjoy the thickness of the guitars, mind you. The song material ranges from the suitable poundage and groove of Lobotomia (Lobotomy) to the more gore-filled depths of Ihminen, Apina (Human, Ape) and the title track. Overall the package is very clearly by the old school, for the old school. 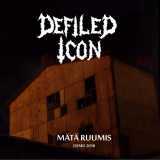 There is very little complexity and even less originality at work here but I am very confident that fans of dirtier death metal should get a kick out of Defiled Icon and their Mätä Ruumis-demo.